Rooms from $42.40 per night. Description This Kingsland, Georgia hotel has an outdoor pool and free breakfast. This hotel is also pet friendly. Free Wi-Fi free continental breakfast free parking and an outdoor pool are waiting for our guests at Days Inn Kingsland Ga five minutes from downtown Kingsland. The two-story Days Inn has 67 rooms equipped with mini-fridges microwaves coffeemakers cable TV and clock radios. Some rooms have jetted tubs and local phone calls and Wi-Fi are free. Non-smoking rooms are available. Guests are treated to a free continental breakfast each morning and a dip in the outdoor pool offers refreshment and relaxation. 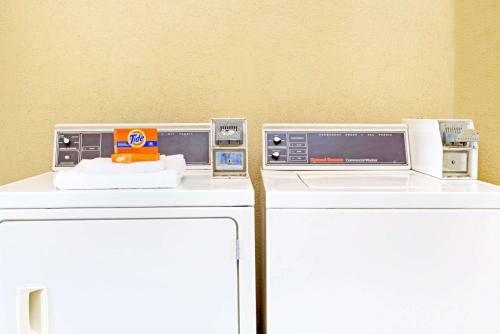 The hotel also offers business services a guest laundromat and free parking. Days Inn is two miles from downtown Kingsland and 15 minutes from St. Marys Historic District Naval Submarine Base Kings Bay and the Submarine Museum. Play a round at Osprey Cove Golf Club a 10-minute drive or enjoy the scenery and beaches at Crooked River State Park and Cumberland Island National Seashore within 20 minutes of the hotel. The hotel is 15 miles from Jacksonville International Airport. Add Days Inn By Wyndham Kingsland Ga to your free online travel itinerary.